DGX - Dependable Global Express started shipping to Guam from the continental USA in 1981, when Founder, Ron Massman, bought a company that shipped to Guam for a grocery distributor. When current president Brad Dechter joined DGX - Dependable Global Express in 1982, the Guam trade lane became the first trade lane for which he was responsible. Since DGX was shipping from California to Guam at that time, Guam helped with the future direction of the company: helping to refine their mainland trucking network to cover more inland points. Also, it helped them to replace their delivery agent on the Island and realize they needed to begin shipping from Guam to California. Lessons learned in the microcosm of the Guam trade were eventually used across all services. As DGX listened to the needs of their Guam customers, they changed their name to help the local customers feel their specific needs were being addressed. 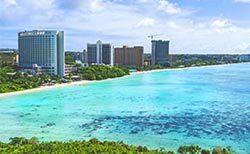 In 1989, the company opened their trucking operation on Guam, which was so successful it became the impetus behind opening future trucking operations in Hawaii. DGX also opened shipping from Guam to California and the rest of the USA, an eastbound service similar to their operation in Hawaii. Eventually Mr. Dechter became president of the Forwarding Group of the Dependable Companies and was thankful for his Guam experience that helped to launch his subsequent career. DGX - Dependable Global Express wants to thank their many friends in Guam that helped them develop their business on the island and meet the many, diverse needs of the local businesses there. “Thank you to the people of Guam for the opportunity to handle your shipping to Guam (and Saipan) as well as being good people and helping us in our quest to be the best at shipping to Guam!” -- Brad Dechter, President, DGX - Dependable Global Express.